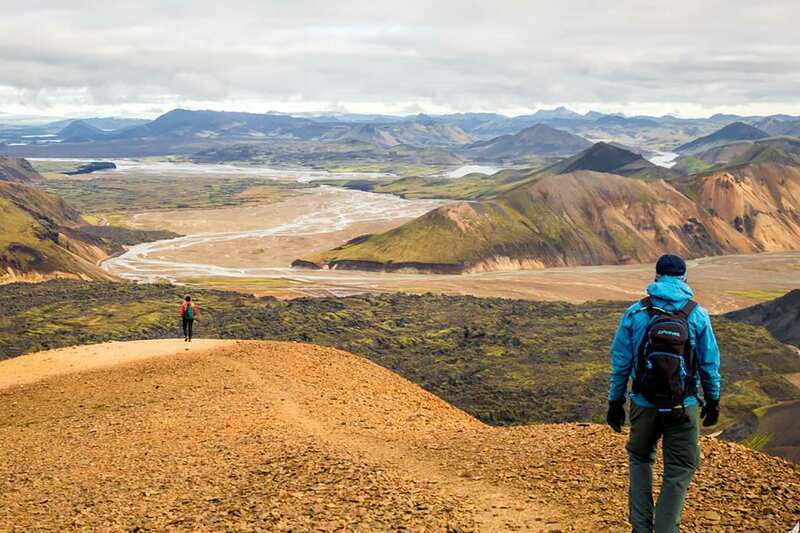 Iceland's most famous hiking trail Laugavegur, is known worldwide for its astounding and breathtaking sceneries. 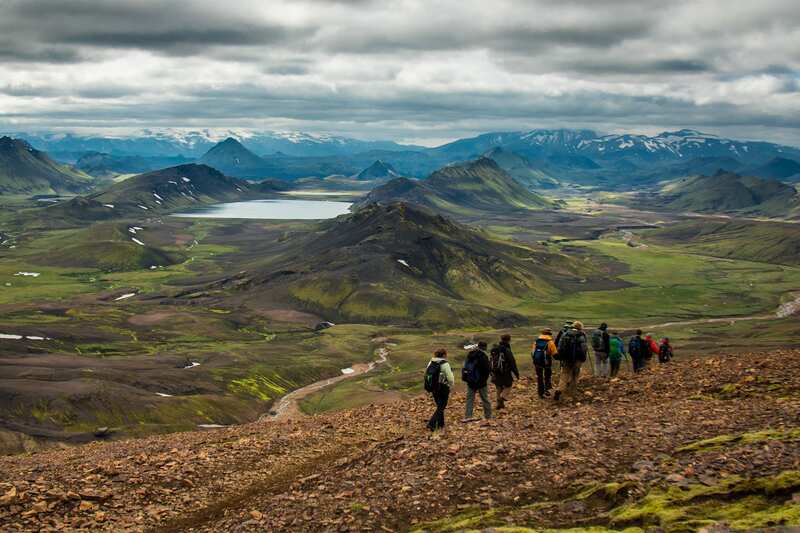 Join us on this 4 day trekking adventure where we experience the highlands of Iceland and its diverse landscapes. 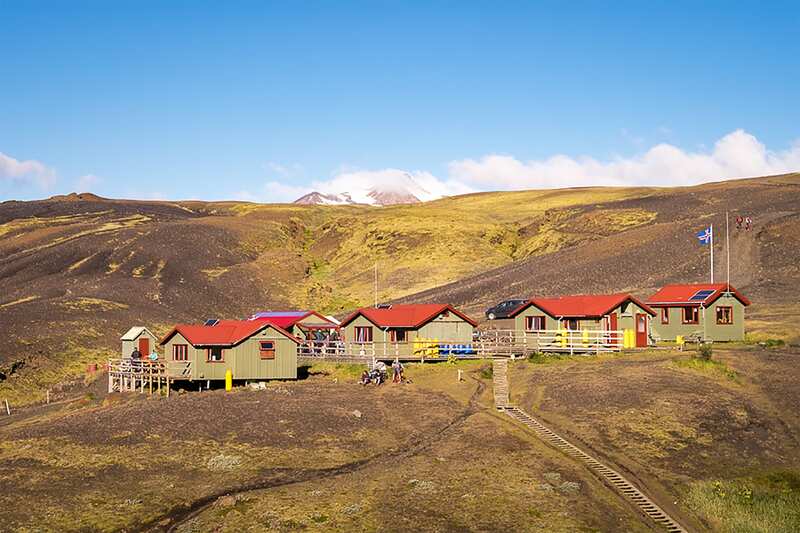 Glaciers, bubbling hot springs, fields of lava, multi colored mountains and much much more! 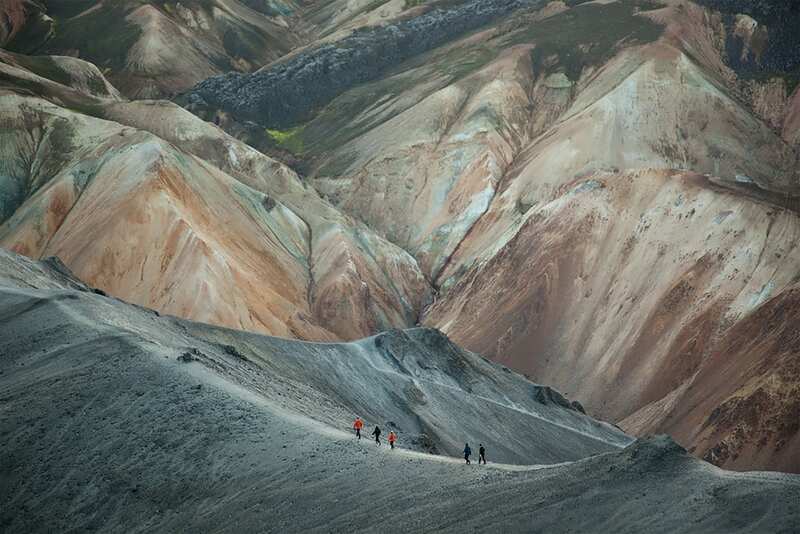 Starting the Laugavegur Trek in Landmannalaugar, a geothermal paradise globally known for its steaming hot springs and colorful rhyolite mountains. From there we make our way deeper into the highlands where we are greeted with glaciers and glacier rivers, black sands, hot springs, waterfalls, geysers and volcanoes. Scenery and landscapes throughout the trek are truly breathtaking. With numerous stunning natural features in every step and views over mountains and glaciers as far as the eye can see. 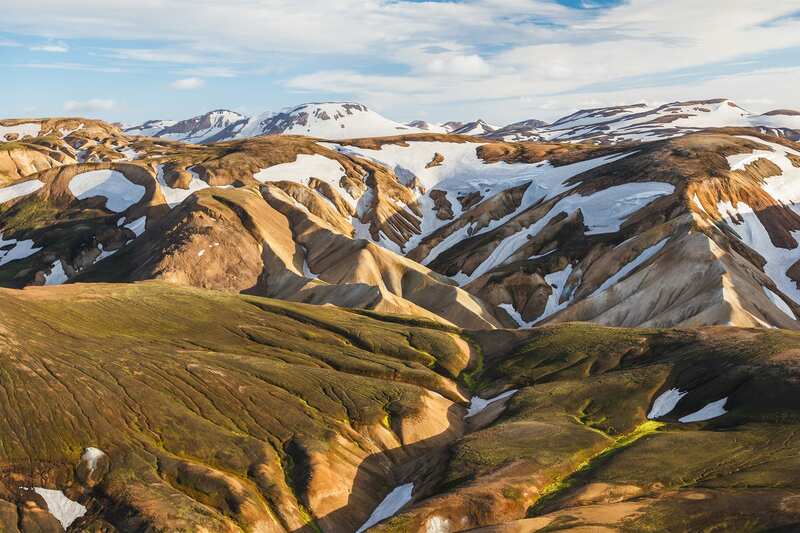 While absorbing everything Icelandic nature has to offer our guides will tell you about these mysterious areas, the landscape, flora, fauna and folklore tales that Icelanders have been brought up hearing throughout the centuries. Our guides will always make you feel safe while we make our way on this unforgettable trail, stopping at all the right places making sure you get the absolute best experience every day. 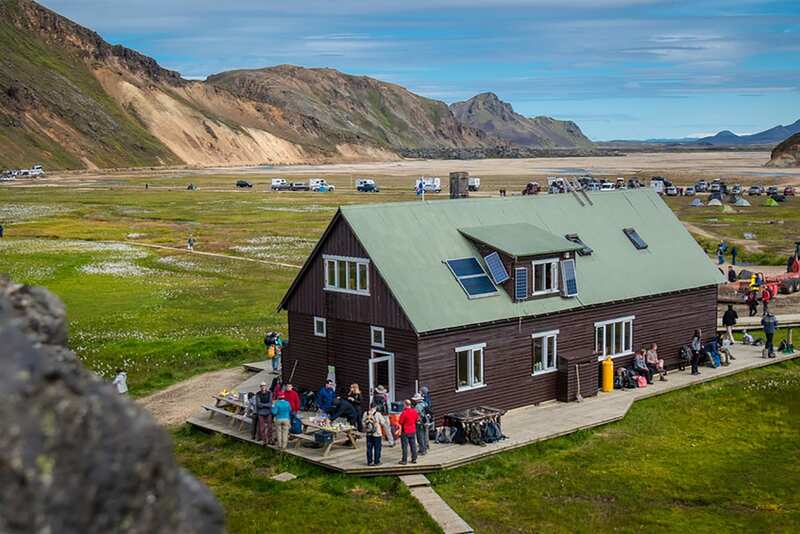 We spend our nights in remote mountain huts at enchanting locations like Álftavatn , Emstrur and Hrafntinnusker which we think adds to the rural charm of the hike. In the huts, the guides will, along with the group, prepare great meals to enjoy together in a magical environment and atmosphere. Sometimes we even take an evening stroll to see some of the secret places we have found trekking the area off the beaten track. 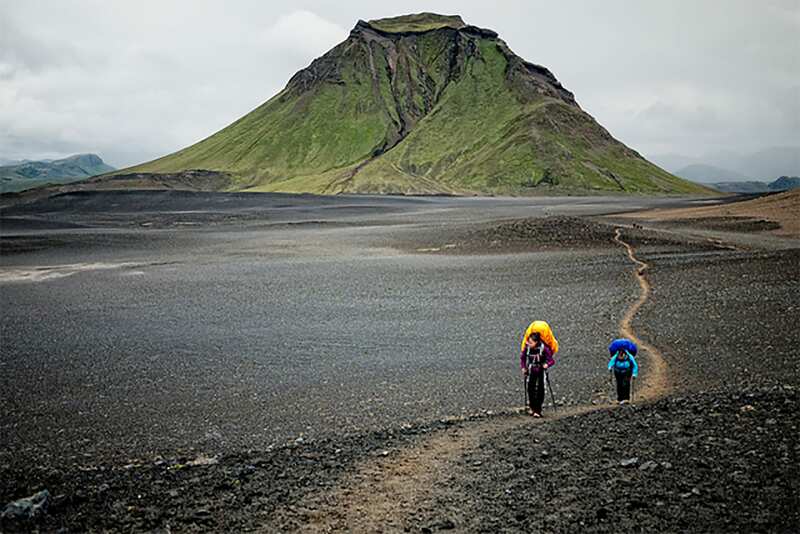 At the end of the Laugavegur Trek, we find ourselves in Thorsmork (Þórsmörk), a green and fertile valley which takes its name from the Norse god of thunder, Thor, who is believed to have created the valley by striking down his hammer. 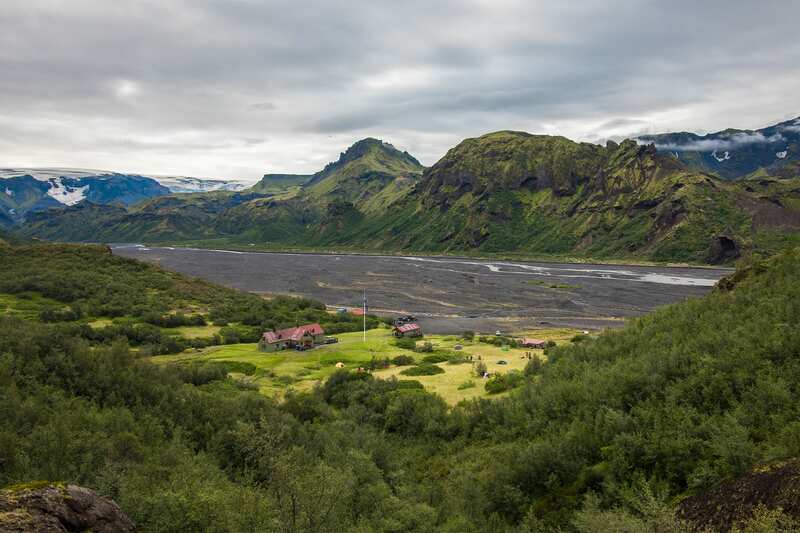 Thorsmork is nestled at the foot of the famous glacier Eyjafjallajokullwhich erupted in 2010 and completely reformed some of the area. 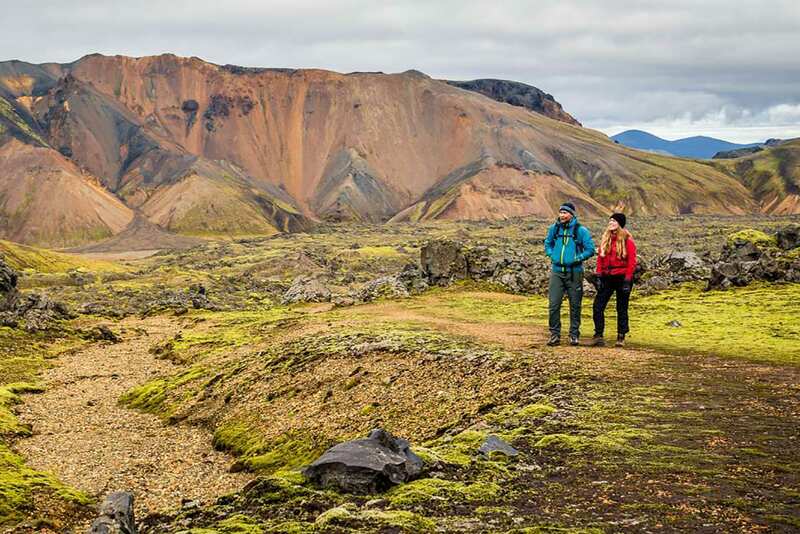 The Laugavegur trek gives you the opportunity to explore some of the most remote places in Iceland all while enjoying the magical beauty of Icelandic highlands. The tour starts by the Reykjavík tourist info at Reykjavik's City Hall (Ráðhúsið) by Tjörnin pond at 7.00 a.m. It's located in downtown Reykjavik and within walking distance from most hotels, hostels and guesthouses in central Reykjavik. We also offer pick up at selected locations around Reykjavik (see other pick up locations in tour description). After introductions, we board the scheduled bus that takes us to Landmannalaugar. 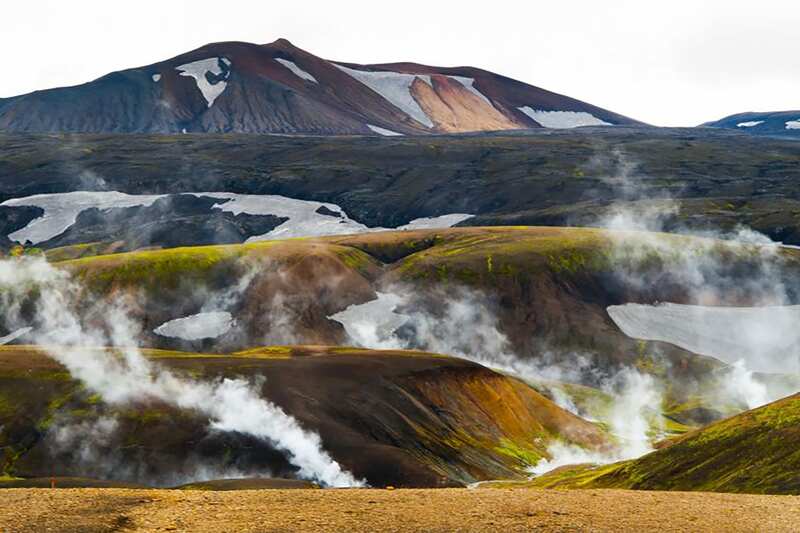 The drive takes about 3-4 hours, on the way we travel along the south coast and then turn inland and pass Iceland's most active volcano, Hekla. Our hike starts in Landmannalaugar as we walk through this geothermal wonderland and look at the colorful mountains and steaming hot springs. The trail takes us through the rough lava field, Laugahraun. From there we move to the slopes of Brennisteinsalda, which is known worldwide for its incredible spectrums of colors and photogenic looks. We walk by the beautiful hot spring Storihver before crossing into the obsidian desert by Hrafntinnusker. Storihver er one of the very few green grounds we will encounter on this day. We spend the night at Hrafntinnusker. After a communal breakfast, we head out again and walk along the Reykjafjoll mountains and then descend into the Jökultungur area. The geothermal activity has turned these gullies yellow and red. We will leave the colorful rhyolite mountains and enter into an area with dark palagonite mountains and a breathtaking glacier view. If the visibility is good we hike up to Mt. 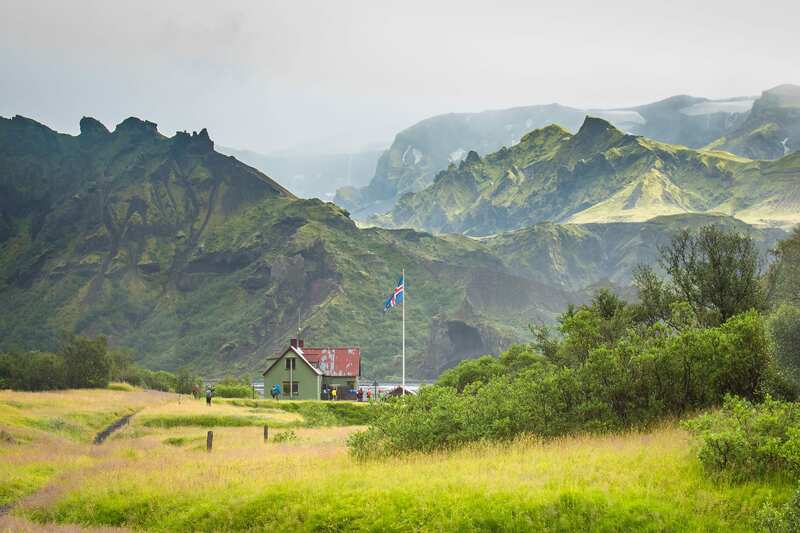 Haskerdingur were the view greets you with countless glaciers, mountains and volcanoes. During the next steps, the landscape will be a lot greener and you might notice a considerable increase in vegetation. From the top of Jökultungur, there is a great view over the Fjallabak area and lake Álftavatn which is our next overnight stop. The trail down Jökulstungur is rather steep but once you are down you have landed in a fertile paradise on the banks of the river Grashagakvísl. Before reaching Álftavatn we cross an unbridged stream on foot. We spend the night at the camping site right next to the lake. We start the day with another refreshing stream crossing as we make our way past the green volcano Stórasúla and into the black desert of Mælifellssandur. On our way, we will see Hattafell, a volcano with a strange flat top. 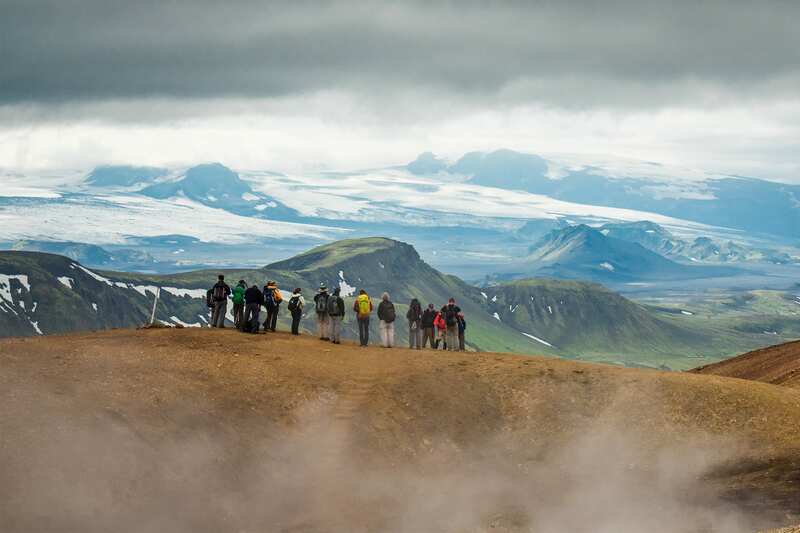 We walk through this black glacial desert and into Emstrur where there is a chance to enjoy a view of Eyjafjallajokull and Myrdalsjokull glaciers. Emstrur is a lush region where farmers used to graze their sheep during the summertime. Just before reaching Botnar we turn of the path to look at Markarfljótsgljúfur, approximately 200 m deep canyon carved out by the glacial river Markarfljot. Botnar is a little green oasis, a welcomed sight after walking through the black sands. We put up our tents and spend the night at Botnar. We put Emstrur behind us and on our way to Thorsmork. The trail takes us within a few kilometers from the great Myrdalsjokull glacier. As we descend towards Almenningar a few trees can be seen, which is a sign we are getting closer to the coast. We walk past the characteristic mountain Einhyrningur (“The Unicorn”) and into the dense birch forest in Thorsmork. Thorsmork is a green valley nesting under the glaciers Eyjafjallajokull and Myrdalsjokull, a truly magnificent place. In the afternoon we take the bus back to Reykjavik where we will be returning at around 21:30.